Partners for Environmental Progress (PEP) recently asked Frank McFadden, P.E. to speak at a monthly lunch and learn event. McFadden Engineering, INC is proud to be a PEP member and support their commitment to environmental responsibility. Mr. McFadden spoke on the Alabama Department of Environmental Management’s (ADEM) expanding permit options for the discharge of treated wastewater. PEP members are embracing water reuse expansions in the state of Alabama. 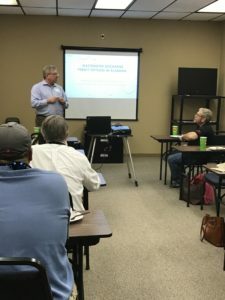 Click on the link to read about the PEP Lunch and Learn: Water Reclamation in Alabama.